$10 Off $25, $20 Off $50 Purchase At JCPenney! You are here: Home / Great Deals / $10 Off $25, $20 Off $50 Purchase At JCPenney! Cash off on top of sale prices = Great Deals! 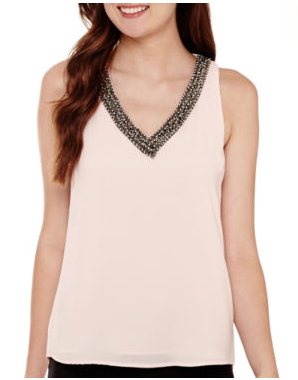 This XOXO® Sleeveless Embellished Neck-Trim Top is marked down from $50 to $29.99! (What a gorgeous color!). Additionally, you can get $10 Off $25, $20 Off a $50 Purchase At JCPenney! Now this top is only $19.99! That’s 60% off the original purchase price! A ton of other great deals to be had! Be sure to use promo code 2HOTSALE at checkout to get your extra discount through August 8! Or, print your in store coupon! Online Only you can get 25% off $150 or 20% off a $100 purchase with promo code HOTSVNG!